The Secret to Money is an app that is designed to change the way you think about money, and to radically change the circumstances of money in your life. 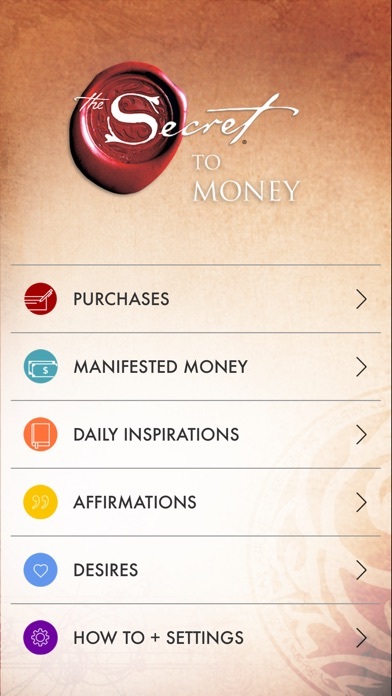 Inspired by Rhonda Byrne's worldwide best selling phenomenon, The Secret, in this app you will develop a whole new perspective on your own personal finances and potential to live a life of abundance. 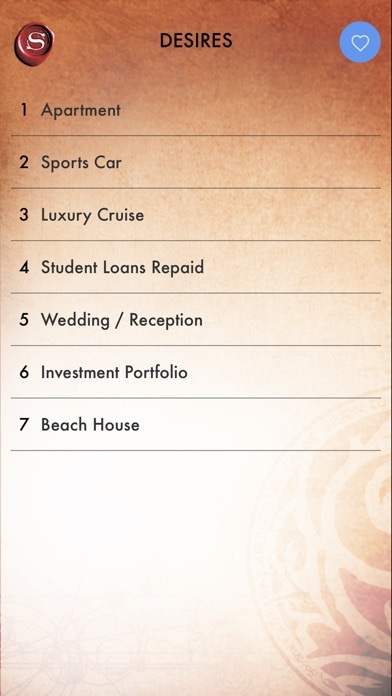 The Secret to Money is a personal development program of games and daily activities created by Rhonda Byrne herself, featuring 5 powerful Secret-inspired practices that will help you develop a wealth mindset: DESIRES PURCHASES MANIFESTED MONEY DAILY INSPIRATIONS AFFIRMATIONS DESIRES: In this practice, you create a list of 7 things you would buy if money were no object. This "Secret" list reminds you of why you want more money in your life, and what it would actually feel like to have the things you desire most. PURCHASES: In this practice, you will change your mindset about money by spending large amounts of money in your imagination. 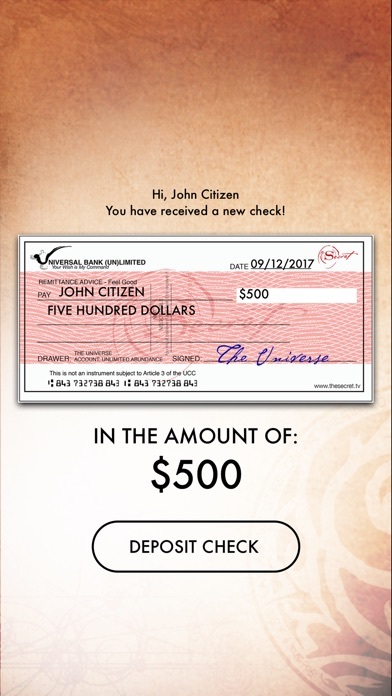 Every day, you will receive virtual checks in escalating amounts from the Bank of the Universe, as first introduced in The Secret book. 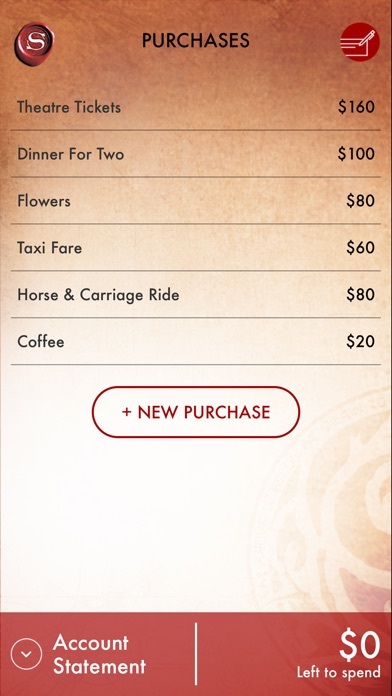 Using your imagination, you “spend” each check on whatever you want or need, and record these purchases within the app. Currencies are localised for each country and set according to the language and location setting on the phone or tablet. MANIFESTED MONEY: In this practice, you record all the ways that you have manifested money today - money you have received, saved, were gifted or refunded. You will be surprised by how much "Secret" money you begin to manifest every day that you are practicing The Secret to Money. DAILY INSPIRATIONS: When it comes to money, a little bit of inspiration goes a long way towards increasing the money in your life. 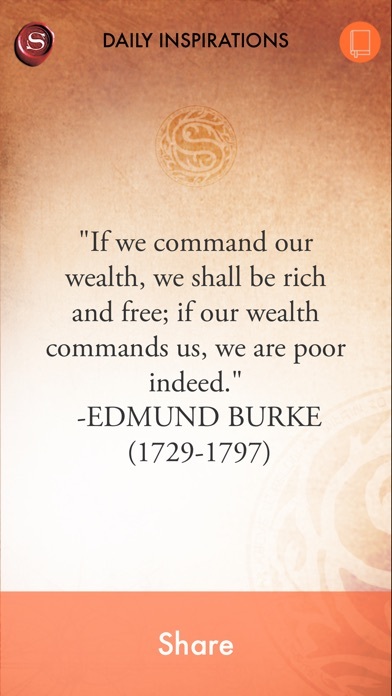 In this daily practice, you will receive inspiring, financially themed messages drawn from The Secret books in order to help you change the way you think about money. Each inspiration is available to share. AFFIRMATIONS: Affirmations are positive statements that you make to create a positive mindset and change your life on a particular subject. In this daily practice, you will read 20 unique affirmations of wealth and abundance inspired by The Secret to help change your money mindset. The Secret to Money was designed specifically for you as your invitation to use The Secret in order to live the life of your dreams. As Rhonda says herself: "When I discovered The Secret back in 2004, the first big subject that I used The Secret for was money. "Like many people, I was brought up with the belief that money is hard to come by, and that you have to work really hard for money. I even had the belief that I would never have much money because my family didn’t have money. "All these beliefs came from just one belief – a belief in a lack of money. "So, in 2004, while researching for The Secret film, I created many different money practices and invented lots of imaginary money games in order to change my belief in a lack of money to a belief in an abundance of money. I committed to these practices, and did them every day. Considering the decades I had believed in a lack of money, it didn’t take too long for me to see the circumstances of money begin to change in my life. And today, there is no lack in my life whatsoever. "I know that whatever I can do anyone can do – and that’s why we created The Secret to Money App. The Secret team has taken my life-changing money practices that took me from lack to abundance and put them into The Secret to Money App. The App is simple, practical, and designed to radically change the circumstances of money in your life, as it did for me." Keeps me focused on what I want to attract! Just love manifesting things into my life. Thank you for guiding me! Oh no please help, I purchased the wrong one. I don’t want the secret to money. I just want the regular secret app. Not sure what happened. It’s easy to focus on wealth with an anazing app like this. Daily checks are awesome! The app keeps me focused and aligned with the thought process needed to make this work. The Universe provides and I am a Money Magnet!!! I live by this app & apply the words to my daily life. It has truly helped me focus. Best app or tool ever! I love this app! So glad I downloaded it!